Note the lack of yellow or olive, grey-brown upper-parts, buff breast and light buff eye strip. In particular note the warm buff below and behind eye. Common Chiffchaff for comparison, note the distribution of yellow which is absent in the Siberian Chiffchaff. Breeds in Siberia and winters in the Himalayas area. Thought to be a regular winter visitor to Western Europe and UK. Thickets and copse, hedge-lines and parkland, can turn up almost anywhere on passage. 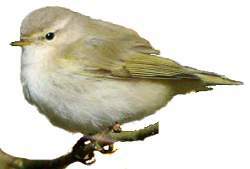 Once considered a sub-species of the Chiffchaff the Siberian Chiffchaff is now considered a separate species. 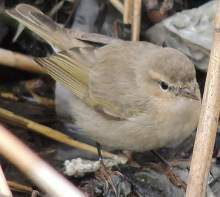 The bird is considered rare in the UK but it is believed that it is probably more common than is reported due to the difficulty of establishing the birds identity from the now common wintering Chiffchaff, especially in the South West. The Siberian Chiffchaff has a very different song to the Common Chiffchaff but unfortunately winter birds rarely sing and tend to have a monosyllabic call not unlike a Bullfinch.